Monarch. (1)|A hereditary sovereign, as a king, queen or emperor. (2) A sole or absolute ruler of a state or nation. (3) A person or thing that holds a dominant position. (4) A butterfly. 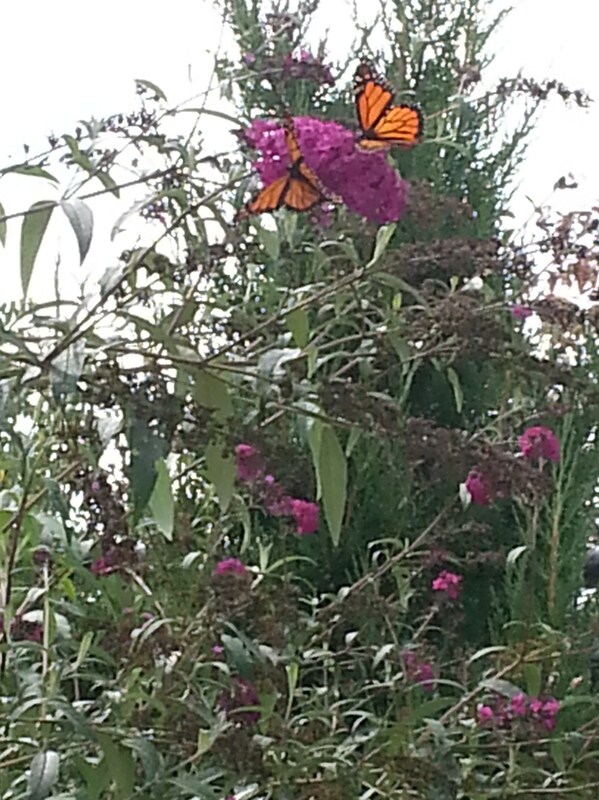 I’ve never seen a Monarch butterfly until this past Sunday, other than in pictures. I was/am thrilled that I saw not only one but a group of four as they fed on the nectar of the flowers. One took flight, flew around the area and then appeared to dive bomb a friend who was with me at the time as she frantically clicked her phone’s camera to catch a picture of the butterfly. We were like children, entranced at the marvel of life and the beauty that surrounds us. That was the also the first day of MKMMA. My life is changing and for the better! Some of what I’ve learned this week is that when I am aware, I take in ALL that surrounds me and SEE what has always been there. That by taking the time to experience ALL that is, I can see that there is more. More of what I want and desire and that I am are worth it! Life and living isn’t complicated unless we make it so. By making it so I have the power to un-make it, or rather, to change it. Change is within. This is what I pay forward to the world. I am a monarch. I am a person that holds a dominate position. The position that I hold is one that creates my happiness, my worth and my persona. This is a position that we all hold for ourselves. My happiness, worth and the person I am isn’t what someone else has to say for or about me. I have that power. So do you. Thanks Stephen. It means a lot to me. All the Best, Valerie J. Thanks for the like Stephen. Hi Valerie, What a beautiful and powerful blog post. You’re positively inspiring! I look forward to following your blog posts. I wish you great joy on your MKMMA journey. Aloha from the West Coast of Canada. Thanks so much for the like and the kind words. I speak from the heart. May your MKMMA journey be one of great insight. Brilliant post and observation. Well done. You are so connected. Have a awesome journey. Thanks for the like. I’m not sure about all this as it’s new to me!